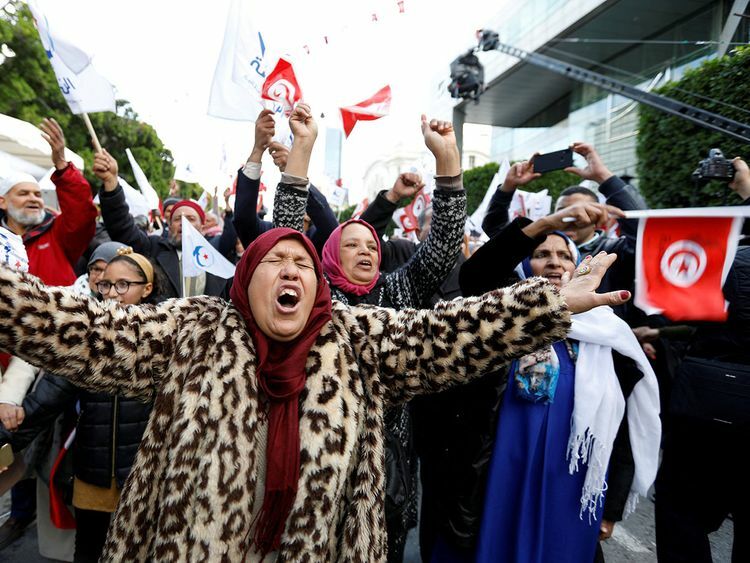 Tunisia: Thousands gathered on Monday in Tunisia's capital as the country marked eight years since a democratic uprising ousted its long-time strongman. The rally came amid deepening economic troubles in the North African nation and resurgent anger at the revolution's unfulfilled promises. Tunisians marked the eighth anniversary of the success of the popular uprising that ousted President Zine Al Abidine Bin Ali. However, Tunisians are still looking forward to genuine political stability that would help the economy recover, ease financial pressure and improve lives. The turmoil following the 2011 revolution has caused political instability and while in the past, two initiatives helped the country out of looming crises, the situation today ahead of the presidential and legislative elections scheduled for later this year is ominous without much needed strong signs the economy is recovering. 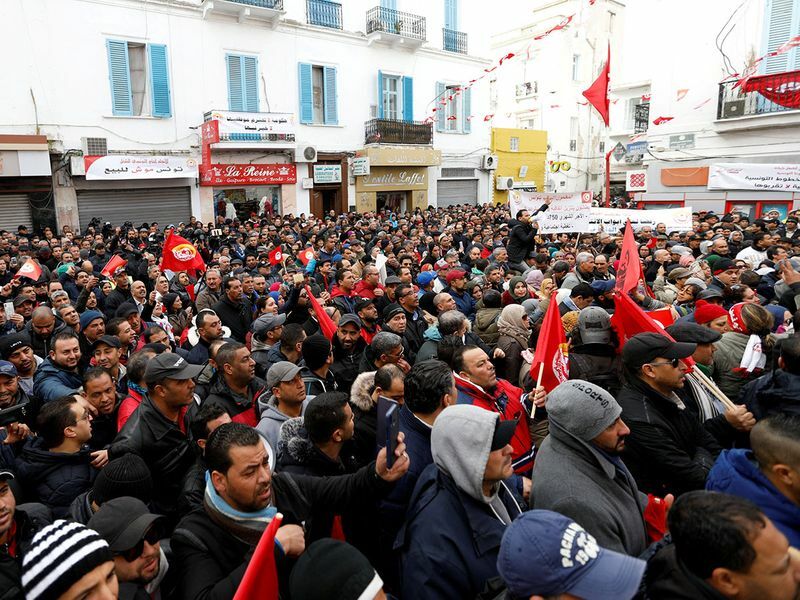 The political turmoil is clearly reflected in the fact that Tunisia has had 11 governments in the eight years since the toppling of President Bin Ali on January 14, 2011. The various transitional, party and technocrat governments have had to work under high pressure, exerted mainly by the multitude of political parties, and consequently failed to fulfil the aspirations of the people. Three prime ministers had to resign — Mohammad Ghannouchi, Hamadi Jebali and Ali Arayyedh. Only Beji Qaid Al Sebsi held the posts of prime minister and president of the republic. The North African country has had three presidents in eight years, one more than it had in 55 years of its independence, from 1956 until 2011. Fouad Mbazza became president after Bin Ali left the country and the post became vacant. He was succeeded by Munsif Marzouqi, chosen by the Constitutional Council, and Al Sebsi who was elected in 2014. January 17, 2011: Mohammad Ghannouchi forms a national unity government with many of the last ministers under Bin Ali keeping their portfolios. January 27, 2011: Ghannouchi announces a new cabinet, leaving out many of the former ministers. March 7, 2011: Al Sebsi, after taking over from Ghannouchi who resigned on February 27, forms the first cabinet not to include ministers from the Bin Ali era. December 22, 2011: Hamadi Jebali forms the new cabinet after his party Al Nahda wins the Constitutional National Assembly on October 23. March 8, 2013: Ali Arayyedh forms the cabinet after Jebali resigns on February 19 following his failure to make up a new government. January 26, 2014: Mahdi Juma forms a non-partisan cabinet in line with a road map drafted by participants in the national dialogue, an initiative launched by the influential Tunisian General Labour Union on July 30 to ease the country out of a stifling crisis. February 2, 2015: Habib Essid forms a new cabinet, made up mainly of ministers from Al Nida, the party that won the legislative elections on October 26. The cabinet also included ministers from Al Nahda, Afaq and the Free National Union. January 6, 2016: Essid reshuffles the cabinet, naming several new ministers. August 20, 2016: Yousuf Chahed forms a national unity government based on an initiative launched by President Al Sebsi on June 2 following a national consensus. The cabinet is tasked with combating terrorism, eliminating corruption, strengthening democracy, finding more jobs, improving living conditions and investing in the poorer areas of the country. September 6, 2017: Chahed reshuffles cabinet, appoints 13 new ministers following consultations with several political parties. November 5, 2018: Chahed reshuffles cabinet, appoints 11 ministers and re-appoints seven others.